Bose SoundLink Revolve review | What Hi-Fi? There’s no shortage of portable Bluetooth speakers on the market, but the £200 Bose SoundLink Revolve ticks all the right boxes – and then some – to stand out from the rest. The speaker’s cylindrical design is key to delivering its 360-degree sound. Inside the sturdy aluminium casing, there’s a full-range driver firing downwards into a patented diffuser plate, which aims to spread the sound out evenly in all directions. There are also two passive radiators inside, responsible for reinforcing the lower frequencies. They’re placed opposite each other to cancel out any vibrations. 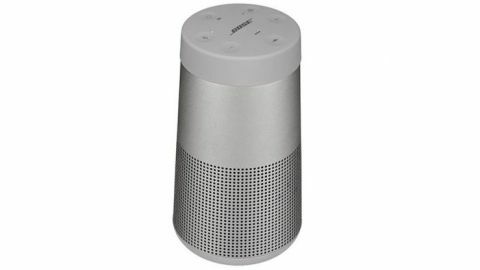 The Bose Revolve is a strikingly petite speaker, and we can see it fitting into just about any space in your home. The speaker has a decent heft – it feels more substantial than the similar-sized Google Home, for instance – but it can still be held in the palm of your hand. Designed to be portable, the Revolve is compact enough to be carried in a backpack. You get 12 hours of battery life – that’s a good chunk of listening, though it’s worth noting that rivals such as the UE Roll, Boom 2 or Megaboom give you 15 and 20 hours respectively. We’re not sure you’d want to lug it to a festival, as it’s water-resistant – not waterproof – and not wholly designed for rugged, muddy terrain like many of its rivals. Its IPX4 rating means it will survive splashes of water, though. The Revolve’s rubber top can get a bit grubby, more so the ‘lux grey’ (silver) finish rather than the ‘triple black’ (black) version. And while it’s designed to withstand knocks and drops, our sample already has some scratches on the finish. The Revolve is a straightforward Bluetooth speaker – pairing is swift, and it automatically connects to your smartphone the next time you fire it up. There’s also a 3.5mm input if you want to hardwire other music sources. The six buttons on the rubber top of the speaker let you switch between these two inputs (an LED lights up to indicate connection), adjust volume and turn the power on and off. Press down the power button, and a voice will tell you how much battery charge is left. A neat touch from Bose is that you can pause, play and skip through your music using the multifunction button (the one with the three dots). You can also use that button to speak to your smartphone’s voice assistant – even if your phone is in another room. The buttons are responsive, although it’s more likely you’ll be using your smartphone or tablet to control and select the music anyway. The free Bose Connect app is worth downloading for updates, as well as checking the speaker’s battery level and enabling Party Mode – which lets you connect two Revolve speakers to play in tandem or as a stereo pair. For such a small speaker, the Bose Revolve delivers a surprisingly big and bold sound. It has no problem filling up our medium-sized test room – even at two-thirds of its full volume. It does its key job – spreading sound around evenly – with aplomb. Even as we move around the speaker, there is little variance in the presentation. The music remains solid and robust regardless of our position. That solidity is what makes the Revolve so listenable. We play Linkin Park’s One Step Closer and the drums hit with a satisfying thump, basslines are deep and full bodied, and the rhythm is punchy and gripping. Small Bluetooth speakers have a tendency to exaggerate the lower frequencies in a bid to impress – Bose has been guilty of that in the past – but the Revolve strikes an enjoyable balance. There’s a warmth to the sound that makes it enjoyable to listen to, and this time, Bose steers clear of making the bass go too boomy. It delivers plenty of detail alongside the punch. The guitar strums in Death Cab for Cutie’s A Lack of Colour sound delicate and precise, while voices are gentle and melodic. It’s not perfect – we wish the Bose sounded clearer, and that edges of notes were more definite and crisply defined. Its rival, the UE Megaboom, is more articulate and handles dynamic shifts and rhythm changes with more confidence. The Megaboom delivers a bigger scale of sound, too, but then it is physically bigger. The Megaboom breathes in more openness into the performance, and you can identify instruments’ placement better, too. The Bose Revolve is less insightful, but it’s still fun to listen to. Its sense of energy and drive is apparent with whatever you song you play through it, and when it goes loud, it’s capable of impressive volume. Compared with its main rivals, such as the UE Megaboom, the Revolve is a bit too pricey. £200 is quite a lot to pay for a speaker, especially when the Megaboom is bigger, clearer, more ruggedly-built and available for less. However, it’s hard not to admire the Bose Revolve for its range of talents, though, and despite not getting the full five stars, we can imagine this tiny, talented speaker will still turn plenty of heads.